Indoor Air Quality Mold Inspections. FL Licensed Mold Assessor, FL Licensed Mold Remediator & FL Licensed Mold Trainer. AAA Advanced Air & Mold Solutions Inc. has been preforming Indoor Air Quality Mold Inspections since 1999, and has been in the housing industry since 1970. We are a full service company Licensed as Both Mold Assessor, and Licensed Mold Remediator. Based out of Panama City, Florida and serving the South East United States. All of Florida, Alabama, Georgia, Louisiana, North, and South Carolina. Our Litigation support is Nation Wide! Our services has been used by The Florida Department of Health, The Panama City Florida Department of Health, The City of Lynn Haven, Florida, The University of Auburn in Alabama, Campbell University in North Carolina, and homes and business throughout the Southeast United States. Unlike other companies we take the time needed to identify the problem areas that are causing your mold contamination, and health issues. William E. Fisher, Jr President was Honored With a letter of commendation from the Florida Department in 2007 for the consulting, and inspection/remediation work preformed on state owned properties. If you don’t discover why these problems are making your property an unsafe place to live in or work in your wasting time and money! I’m considered an expert by the State of Florida for Manufactured Housing. 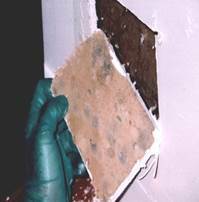 I have been hired as an expert witness for mold related lawsuits throughout the southern states for both residential and commercial buildings. We take pride as a specialized Company for the environmental restoration of Mold, and Water Damaged Properties. Our company provides detailed reports using the information obtained from the inspection site using modern testing equipment, and experience obtained from over 40 years in the housing industry. We provide remediation and safety protocols for every project as needed. Emergency storm damage is also available to assist you in dealing with your insurance companies to help you recover storm damage loss of building, and personal property. Our inspection / sampling of your property (Home) or personal effects (Clothing, furniture, and so on) will be sent to an independent laboratory for analysis. We collect the best samples possible for your insurance claim’s or for litigation support for your day in court. The photo’s below are from some of our past projects. For Quality Mold Inspection or Mold Remediation, and Consulting call AAA Advanced Air & Mold Solutions today!